To purchase the Hobby Boss 1/350 scale USS Alaska scale model manual on printed paper click this PAYPAL button. 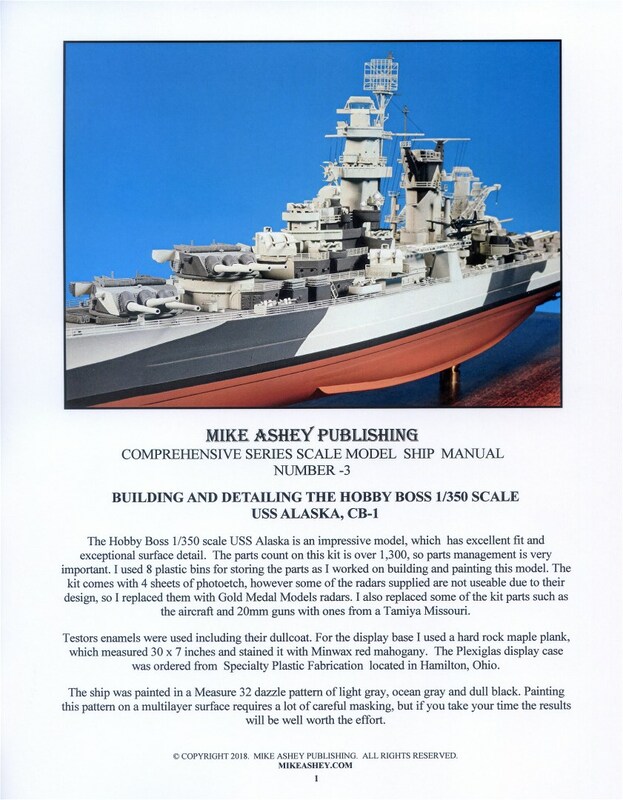 To purchase the Hobby Boss 1/350 scale USS Alaska scale model manual PDF click this PAYPAL button. This comprehensive series manual provides a step by step guide for planning, preparing parts, building sub-assemblies, masking, painting and completing the assembly of this highly detailed ship model, which has over 1,300 parts. The manual shows you how to modify the 5 inch/38 turrets in order to achieve a realistic and accurate appearance as well as how to modify the 12 inch gun assemblies to better position the barrels. The manual shows you how to modify, assemble and reinforce the kits photoetch parts including the smoke stack frames and the delicate aircraft cranes. Some scratchbuilding is also presented in order to replicate the aircraft storage doors. The kit provides four complete photoetch sheets, however some of the radars are not buildable and the manual shows you how to replace them with alternative photoetch parts from Gold Medal Models. Some of the kits plastic parts such as the 20mm guns and the SC-1 Seahawk aircraft were also replaced with kit parts from a Tamiya Missouri. The manual has 40 large photos which show you how to achieve a superior US Navy “measure 32” gray and black tone dazzle camouflage pattern by careful masking, paint mixing and airbrush application on the hull, the deck and the multilayer superstructure surfaces. The manual also provides a listing of the tools, supplies and paints that you will need as well as a listing of replacement parts and the references used for painting the model. If you follow Mike Ashey’s techniques and methodology for building, detailing, masking and painting, you will achieve a museum quality representation of the US Navy’s only World War II battle Cruiser.